My boys, my world! : Shimmerz Blog Hop! By now you have certainly seen the images of our new products, Dazzlerz and Texturez.... have you nabbed some of this beautiful paint yet for yourselves? Aaah, our design team and educators are so in love with this product that we wanted to give you another opportunity (or perhaps several!) to win some through this blog hop!! To play along with us, click on the link below, and just follow the Shimmerz path! Leave a comment everywhere you go, and finally, once you end up on the Shimmerz blog page, tell us what Shimmerz Paint product you would love to get your hands on. Make sure to leave a comment everywhere though, because there are a couple of prizes hidden within some of the Ed team, and DT blog posts! (To be eligible to win these, you must have left a comment on their blog hop post.) You have until May 5th to enter, and we will notify all the winners sometime shortly after!! Its Mothers Day Very soon. So in Preparation, the Challenge for May will be something for the Mums. Our Mums are very special and being a Mum is such a gift. This month create something for your Mum, or to celebrate Motherhood. It can be anything, Just be sure to use Shimmerz! 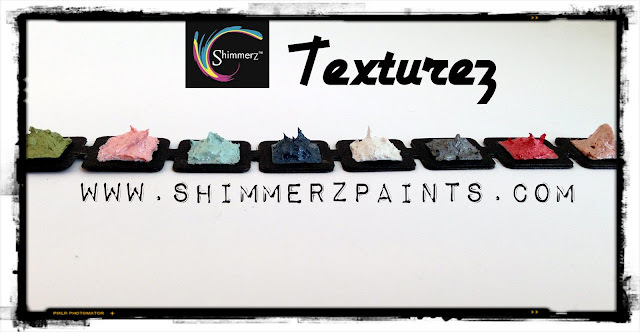 And you will be in the running for.....(wait for it......) A Guest Design spot on our Team for 1 month, where you can Post some projects to our Blog and Facebook Page AND (thats not all.....) win a Prize PACK of Shimmerz Paint. A great Prize this month! So get creating and join in the fun for your chance to win this great prize!! So before you leave me here, I wanted to share with you some Shimmerz creations. I created a mixed media canvas boat for my boys to put up in their room at our holiday house. I used layers of material and paper mixed in with all of the gorgeous Shimmerz product. My next creation has just been shared on the Shimmerz blog. Another beachy canvas piece. I just can't get enough of them and the new Shimmerz products make it so easy! Next up is the gorgeous Mirands's BLOG !!! FUNtastic boat! Seaside and shells with Shimmerz texture and dazzles have amasing effect! OMG...these are both just fantastic...but I love the picture and the beach scene! AWESOME!!! You are very talented!! Maravilhoso seu trabalho! Amei todos eles. Wow, your projects are absolutely fabulous!!! You did a fantastic job. I love that sail boat, and the sea shells!! Oh I wish summer would get here so we can enjoy the beach!!! Never heard of these paints before, so I would enjoy any of them Thanks for the hop. Oh so beautiful Stacey!! I'm always in awe of your creations!! I use to be such a beachbum.... Love what you did... The sailboat piece would look great in my sons room whenever I get it set up lol I want his room to be a sailor theme :) Thanks for some inspiration! Gorgeous piece!! LOVE the textures, colors, seashells and kite!! Just love all the texture you always manage to get into your projects. Fabulous! amazing! you are the queen of a beach theme for me! LOVE your style, and you know it, know it, know it!!! Oh wow!! The texture on your canvases are fabulous! Love your creations, Stacey! Love your projects!!! they're just fabulous!!!! Stace this are amazing!!! I love your Seaside..you always ROCK with the Shimmerz!! Darling boys and love the dazzlerz and shimmerz. Great "Shades of Blue" projects. Wow I can't believe the canvas was quick and easy, it's amazing! I absolutely love all the shells and that writing in the sand effect. I would love to try that. Oh my.... I totally need to pour through your blog and check out you amazing canvases.... My baby is 1 and the planned canvases for his bedroom have still not eventuated!!! I love yours!!!! your boys rooms and house must look amazing with all your art work ....!! Great work on the canvas love the blue too!! thanks for sharing. Your canvases are gorgeous! All this texture! Thanks for the chance to try some Shimmerz products! And thanks for the blog hop! WOW! Those canvases are amazing! I LOVE the beachy feel! Love your projects! All that amazing texture! So gorgeous! Love these projects and love the beach theme! What a great way to use the products too! So much fun with this texture paint. Great projects! Th canvas is awesome and I always love your beachpages! Stacey, the beachy projects are so incredible!! Love how you nailed the colours and textures so perfectly!! Stacey, love both of your projects. The texture is wonderful, thanks for sharing the deets on how to get the look. I will be here for a bit, since I too have a house for of males, so it's nice to find a similar house to share creative ideal! Gorgeous! I love the colors and the textures are amazing!! Oh, Stace- I always love your work. Your canvases are just STUNNING- amazing, amazing :). Stacey, your boat is incredible, and you've inspired me to start making some decor for our rooms at my in-laws' summer cabin - the stuff from the 70's needs to come down! Thanks for sharing! Love the seaside piece - I didn't know Shimmers had a dimensional line - need to learn more for my projects! Fabulous! I love all the fun texture in this piece! Great colors too! Love it!